When the Hotel Brighton opened in the new seaside resort of Brighton Beach in 1878, this three-story, 174-room Victorian-style hotel became an upper middle class paradise. An elegant pavilion led guests to the sandy beach and rolling surf. 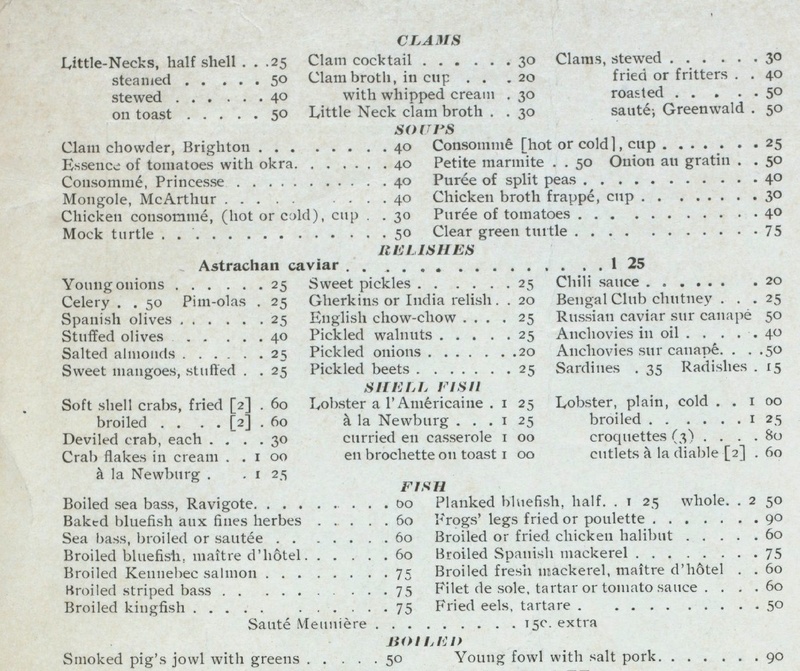 The hotel’s restaurants and banquet halls served an incredible array of seafood and shellfish. The Brighton Beach Music Hall hosted famous performers and bands. Amid all of this seaside fun and frolic, there was one problem. The hotel was built a little too close to the ocean. Ten years later, the Atlantic Ocean was practically lapping at the Brighton’s fanciful piazzas. “The sea has steadily encroached upon the land at Brighton Beach for years . 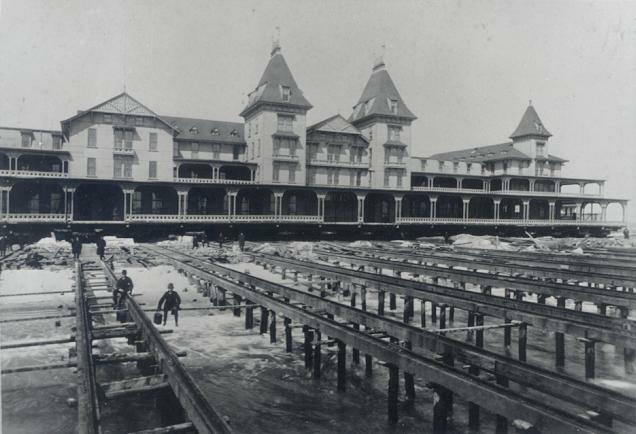 . . Old Neptune has gobbled up a nice bit of real estate with a 500-foot sea frontage and a depth of 500 feet, to which the hotel people hold a title deed,” quipped the Evening World in April 1888. The decision was made to move the hotel. Considering that it weighed an estimated eight million pounds, relocating the massive structure was going to take some thought. The plan the hotel adopted was to put it on wheels—the wheels of 112 rail cars, that is. On April 3, after months of preparation, the big move began. “The first step taken was to drive piles under the entire front of the hotel,” stated one architectural publication. 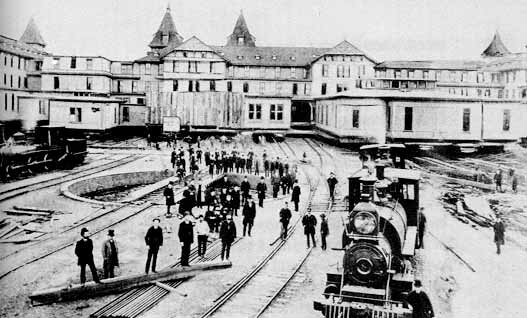 It took 10 days for six locomotives to slowly drag the hotel about 600 feet inland. In June, the hotel opened for the season. “The contrast between the hotel on its present site and the building resting upon piles with the ocean flowing beneath it, as it did last summer, is decidedly striking,” commented the Evening World on June 27. What’s on the menu at the Brighton Beach Hotel? 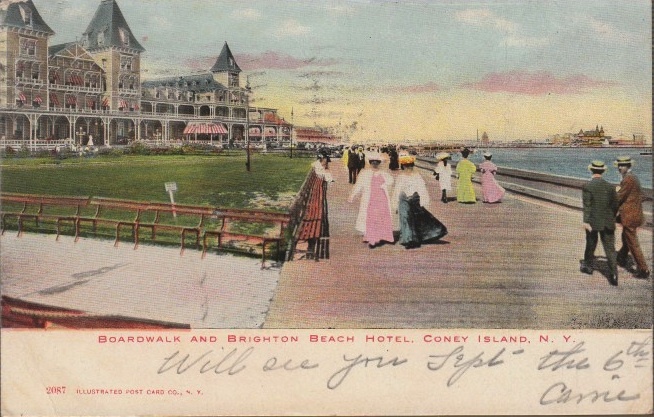 At the turn of the last century, the sprawling Brighton Beach Hotel served as a more upscale seaside resort than its neighbor, Coney Island. And if you were wrapping up your summer vacation there in 1906, you’d probably make dinner plans at the hotel restaurant. So what kind of food and drink would be available to you? We’re talking about a mind-boggling array of seafood (clear green turtle soup! fried eels! ), poultry, caviar, steak, chops, pastries, and ice cream, not to mention a pretty big wine and drink list. 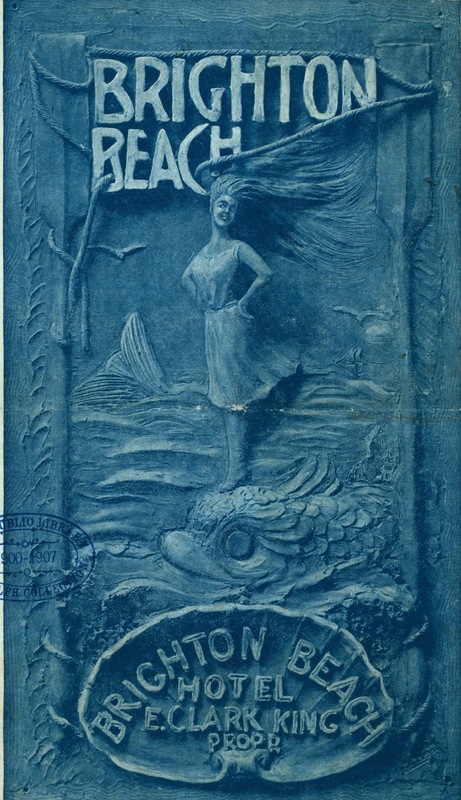 The entire hotel restaurant menu from that year (the front cover is at left) has been preserved as part of the New York Public Library’s menu collection. It’s a fantastic reference that gives us a peek at the city’s culinary preferences over the years. The massive menu selection can be viewed here. But for just the seafood, check out this excerpt from it above. I wonder what exactly was in clam chowder Brighton? 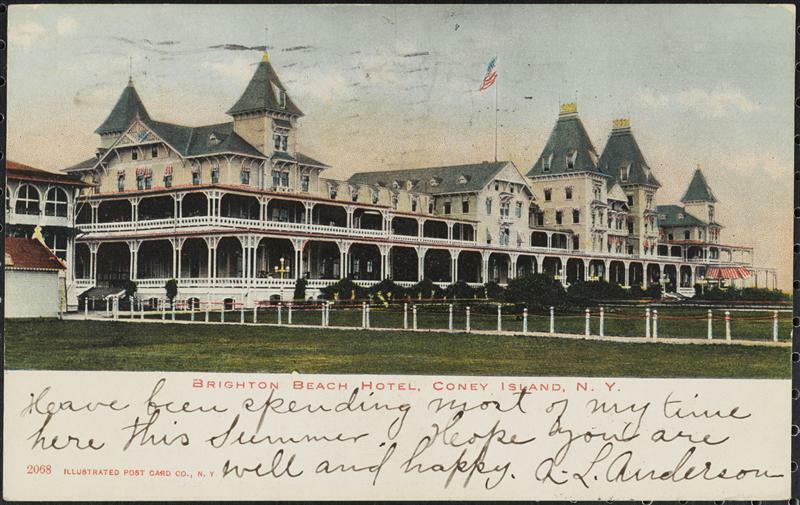 A 1906 postcard of the lovely and genteel Brighton Beach Hotel, once at the foot of Coney Island Avenue. Thanks to Kevin P. for suggesting this menu. Could those be the grand old seaside hotels of late 19th century Brighton Beach, Coney Island, or Bath Beach in this vintage business card? 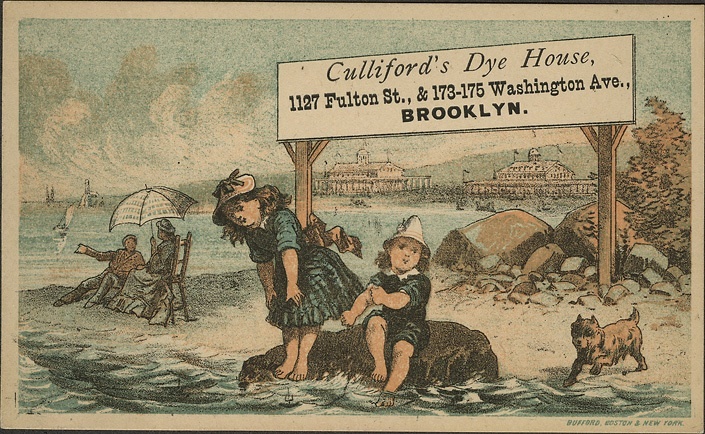 It’s part of the Brooklyn Public Library’s Fulton Street Trade Card Collection, a fascinating digital archive of Brooklyn business ephemera and proof that the advertising biz more than 100 years ago was just as cloying as it is today. 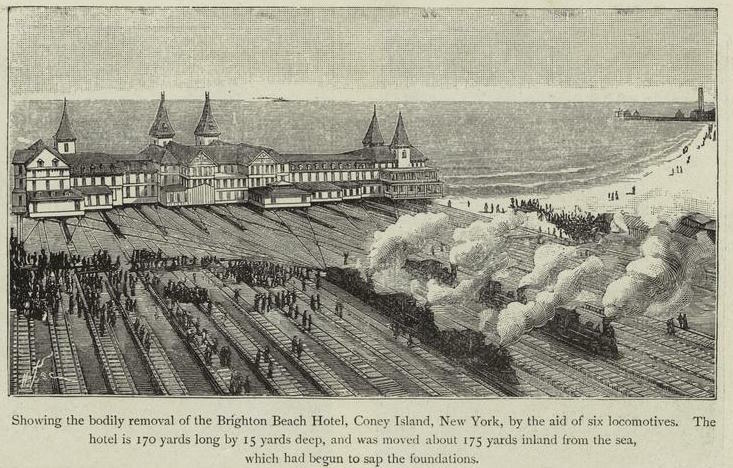 Brighton Beach was developed as a swanky summer resort in the 1860s; impressive hotels were built at the water’s edge. And after Ocean Parkway was extended and the Brighton Beach Railroad completed, the crowds really started coming. One major attraction: The Brighton Beach Race Course, opened in 1879. It featured thoroughbred horse racing and later harness racing (on sand, oddly enough), soon attracting wealthy New Yorkers who liked betting on the ponies. But in 1908, New York State severely restricted gambling, and that put a serious dent in the horse racing business. Course owners came up with a novel idea: converting the track into a “motordrome” for auto racing. The crowds loved it; tens of thousands sat in the grandstand to watch races.